PPIC: Federal money, California and the census - Capitol Weekly | Capitol Weekly | Capitol Weekly: The Newspaper of California State Government and Politics. Most of California’s federal funding has ties to the census. In the most recent year for which an estimate is available (2015), California received about $77 billion in census-related funding—more than 80% of the total federal funds the state received that year. A number of federal programs draw on population estimates derived from the 2010 Census to calculate the share of federal funding for each state. The 2020 Census will soon update these estimates. Federal dollars account for more than one-third of all state spending (including the state General Fund, special funds, and bonds)—more than $100 billion in 2018. Census counts help determine funding levels for a broad range of state programs. The census plays a role in determining how funds are distributed across a range of programs and services. More than half of the state’s population-based federal funding goes to Medi-Cal (California’s Medicaid program), which provides health insurance to low-income residents. 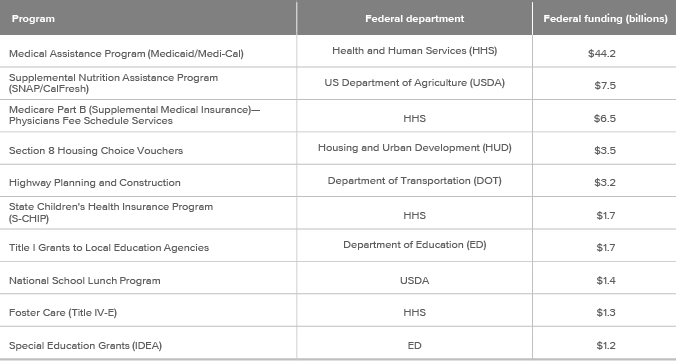 Federal resources also go to nutrition programs, housing assistance, highways, education, and other state priorities. The federal dollars can account for a significant share of state spending in these areas, ranging from 10% of the budget for the California Department of Education to 63% of Medi-Cal. An accurate count can help ensure that federal funds go to populations in need. While funding formulas are typically complicated and vary by program, the size of the populations served is often a component. But target populations can be difficult to count. For example, the formula for distributing Head Start funds includes an estimate of the number of children under age 5 in poverty. While the accuracy of the census has been improving overall, research indicates that the 2010 Census failed to count almost a million children aged 0‒4 and that this undercount has been worsening over the past several decades. An inaccurate count would have a modest impact on some programs, and the overall effect is difficult to estimate. Because federal programs use census data to allocate dollars in various ways, the impact of an inaccurate count would also vary. Nearly half of census-related federal funding to states is distributed according to the Federal Medical Assistance Percentage (FMAP), a longstanding reimbursement formula that factors in the relative wealth of each state. California is one of thirteen states currently receiving the minimum FMAP rate, so—barring any other federal policy changes—this funding would not be affected by an undercount. Also, other large states—notably Texas and Florida—face similar census-related challenges. If California’s count is at least as accurate as the counts in other states, it will not necessarily “lose out.” Another imponderable is the effect on federal funding in the state if California were to lose a US House seat after a 2020 undercount. California is taking steps to ensure an accurate count. The state has a history of providing funding and oversight to ensure an accurate count of its residents. The state’s 2017–18 budget allocates $90 million for the 2020 Census. To oversee this spending and draw attention to the census, state senate and assembly select committees have been formed. In addition, a state committee is focusing on outreach to encourage Californians to participate in the census. The goal will be to ensure that Californians are neither undercounted nor miscounted—that is, to prevent incorrect tallies of particular groups or characteristics. Challenges include larger shares of the populations that tend to be harder to count—for example, renters and young children—and a less-than-requested amount of federal funding for Census Bureau preparation. Also, the inclusion of a question about citizenship—not asked since 1950—could have a chilling effect among immigrants, even though the Census Bureau protects individual identities and it is a federal crime to violate the confidentiality of a respondent. Ed’s Note: Patrick Murphy and Caroline Danielson are policy directors and senior fellows at the Public Policy Institute of California.